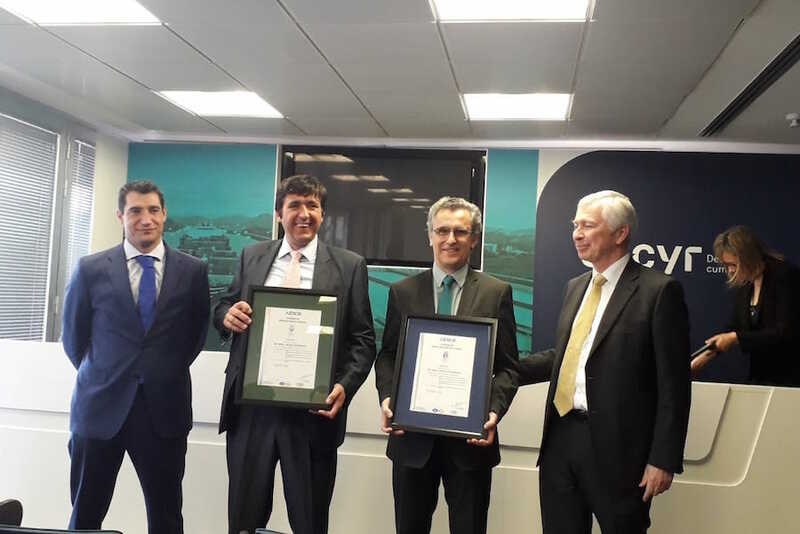 CIRTEC, in an event organized by SACYR, has received on Tuesday March 19th 2019, certificates ISO 9001, ISO 14001 and the CE labels for hybrid modified bitumens PMB 45 80/60C and PMB 45/80 65 C production. The event has counted on the presence of D. Javier Muñoz Ledesma, Director for Compliance Assessment and D. Gonzalo Piédrola Aleixandre, Center Region and European Director, both from AENOR. This milestone is a recognition for high quality work that is being conducting in CIRTEC. Today companies must not only be an example of good service and competitiveness, but also must be examples of quality in their activities and specially talking about environmental sustainability. For this reason CIRTEC, the first company created under a circular economy model, could not be alien to quality. ISO 9001 certificate represents our commitment to high quality and in the same way ISO 14001 certificate shows our commitment with environmental sustainability. On the other hand, in the same act CIRTEC has received CE labels for hybrid modified bitumen PMB 45/80-60 C and PMB 45/80-65 C production. These bitumens are manufactured by adding to the bitumen crumb rubber obtained from end life tires and synthetic polymers, getting highest performance bitumen, and under the most demanding requirements from current Spanish specifications PG3. In this way, CIRTEC, with its additive RARx and its range of modified bitumens, is ready to supply 100% of road works, always looking for sustainability and maximizing the use of crumb rubber in all its products.